Al Roker and Alex Van Halen: Two celebrities and one American Airlines first class seat. The New York Post has a Page 6 report about an incident that happened onboard an American Airlines flight from LAX to JFK. It might be a little extreme, but if I was Tom Horton, the new CEO or American Airlines, I’d probably just ban celebrities. There was the Alec Baldwin incident, as well as a few other celebrity incidents on Southwest Airlines the last couple of years; it’s probably just better for everyone if celebrities take private jets. At the very least, I’d institute a rule that limits the number of celebrities on a single flight. Such a policy would have avoided the kind of situation that happened on Monday, when one celebrity refused to give up his seat to another celebrity. According to the article, Al Roker, meteorologist for the Today Show, was returning from Los Angeles to JFK on American Airlines flight 4. On this route, American operates a 767-200 with a 3 cabin configuration: economy, Business Class, and their Flagship First Class service. Al Roker was seated in 2H in First Class. Next to him was Van Halen band member Alex Van Halen , in seat 2J, and across the aisle from Roker was Van Halen’s wife Stine Schyberg in 2D (Eddie Van Halen and his wife, Janie Liszewsk, were seated in 3H and 3J). Van Halen and his wife were unhappy about their seating assignments and complained (loudly according to witnesses) about the situation, so the gate agent asked Roker if he would mind moving, but the weatherman declined. Moving would have put him closer to a passenger traveling with a dog and Roker explained that he has an allergy to dogs. According to the article, Van Halen and his wife were vocal about their unhappiness and eventually ended up swapping seats with two passengers in Business Class so that the couple could sit next to each other. (Hey, I guess When it’s Love, moving from Flagship First Class for Business is no big deal). I’ve been in Roker’s situation before, and have always agreed to swap, but I would have done the same thing considering the allergy. Truthfully, there are times that I’d rather not move, but do it anyway to avoid the awkwardness of saying no to someone and then having to sit next to them for three hours (in an alternate universe, Alternate AAdvantage Geek snarls something like “These seats are assigned for a reason and if I wanted to play airplane seat roulette, I’d be on Southwest.”). Since it’s a slow AAdvantage news day, I thought it would be a good time for the first ever AAdvantage Geek reader poll. If Alex Van Halen asked you to swap seats with his wife, would you do it? Sure. A first class seat is as good as any other first class seat. No. It's better for everyone if we just stick to our assigned seats. Maybe, if the seats are comparable (aisle seat for aisle, etc.). I'd swap for Eddie, but not for Alex. Having allergies I understand Al’s point, but not knowing when a dog might enter the prcture I’d probably bring some pills. @ Mike – I would have done the same thing, just to get along. And since it’s an even numbered flight, with meal service being served front to back in first class, I wouldn’t be giving up meal selection by remaining on the front row. Give me some form of compensation than sure. What if Alex swapped with the dog person, who would then now be next to Al ? @ PatMike – That’s a perfectly reasonable and logical idea. Obviously, you’re not in the airlines business. 😉 Thanks for the comment! talk about a DYKWIA convention….I feel sorry for the flight attendant on this one!! 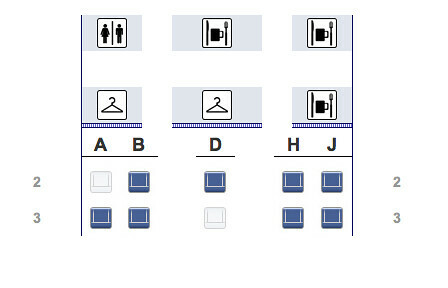 @aadvantagegeek I’m sure you know this, but the Flagship First Class link is to the 767-300/777 Business Class. I WISH the flights from JFK-LAX (767-200) had this nice of a Business Class. Thanks for the correction (and for reading)! Your poll needs another question: Would I swap if I had an allergy? Could Eddie Van Halen just do a string from “Beat It”? Alex should have ripped a huge fart and blamed it on Roker’s garlic breath. Al Roker should be fired from the Today Show for dissing Alex Van Halen. What a schmuck! I will never watch the Today Show again. I think what PatMike was trying to get at was, what would have happened if Alex had asked the person with the dog to swap seats, because then Al would have been directly next to the dog. (unless they had to have the extra seat for the dog) Would Al have then thrown at fit and gotten off the plane? And I am not familiar with the seats on these planes, but if I were traveling alone, I’d much rather have a seat to myself than be stuck sitting next to someone else. Roker was on Howard Stern today. The Van Halen’s would not have been satisfied with him sitting at the window, the wife was throwing a total fit. The D aisle seats are bulkhead and someone is always crossing over in front of you. Roker needed to get some sleep, so the middle row was no good. If rock stars want to sit anywhere, they should spend some cash and charter a jet. Van Halen is a joke. @ Eileen – I’ve actually been on a flight with Roker, and come across him a couple of times at JFK, and he’s always a really nice guy. As for the Van Halens, they’re the reason for the term “rock star behavior”. Thanks for reading! As another person mentioned, Al explained what happened on the Howard Stern Show. The story is much more involved than what is printed here. Al had pre-booked his seat in advance whereas the Van Halens did not. Al stated that Alex was a gentleman, as was Eddy, further stating that it was Alex’s wife who was rude, loud, throwing her bags around and pitching a fit. He also stated he felt Alex was embarrassed by his own wife’s behavior. She knew when she was at the ticket counter that she would be separated and still chose to take her fit on the airliner. Al needed sleep for his show later that day and stated that had it been a husband, wife and child scenario he would have given up his seat immediately. @ Jeremy – Back when I wrote this post, there wasn’t much info on incident. Thanks for sharing more of the details..
Hey Alex van halen’s wife…….plan ahead or sit down and shutup. I’m a big fan a Van Halen, but I just heard Al’s side on the Howard Stern Show and I’m convinced a pre-emptive strike via Page Six was launched against him a to cover up Van Halen’s embarrassing behavior. The wife sounds and looks like a total b@#ch.